Successfully Added 126 Watt CREE LED Spotlight - 20-Inch, 126 Watt, IP67, 11000 Lumens, Over 30,000 Hours Service Life to your Shopping Cart. This magnificent 126 Watt LED spotlight allows you to light up all of your surroundings instantly in a bright white light. Ideal for the working man that needs a strong and stable light, to light up large outdoor areas such as an industrial plant at night, or to be placed on the front of your car or truck – this ultra-bright CREE LED light beam is there to illuminate up your life and provide light in the darkness. With a length of 20-Inch, this LED flood light is guaranteed to illuminate a magnificent area, allowing you to light up all of your surroundings by using merely one spotlight. With a lifespan of over 30,000 hours, this CREE LED light bar is guaranteed to light up your surroundings for years to come. The 43 high-intensity 3Watt LED lights emit together an absolutely stunning 11000 lumens and provide a strong and intense light that is ideal to be used in any imaginable situation. With its aluminum housing and toughed glass, this LED spotlight is extremely durable and can be used in the toughest of environments. Whether it’s inside a factory or outside at the front of your car, this flood beam will work efficiently as it features an IP67 rating. 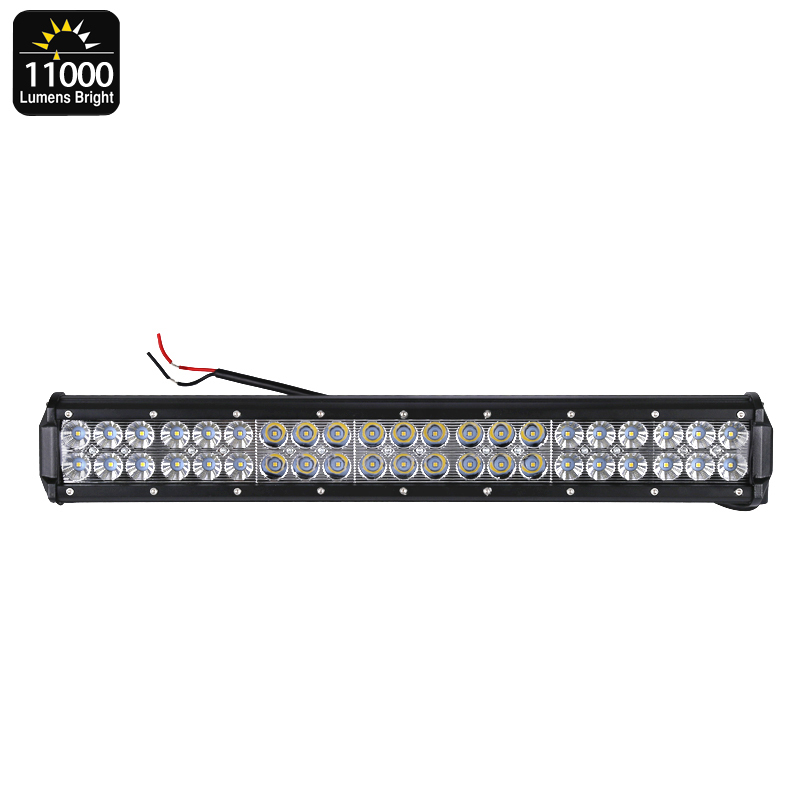 Protected against water, dust, impacts and a whole lot more, this durable white light bar has been built to withstand the toughest of working environments. From the outdoors in the icy North to dusty industrial complexes located in a desert – nothing will stop this beautiful and tough LED light from shining bright and illuminating your surroundings. Coming with a pair of aluminum mounting brackets, this 11000 lumens LED spotlight can be easily installed and attached to any surface – making it perfect for indoor and outdoor use alike. Once attached and installed, this flood beam is guaranteed to light up your surroundings for years to come, allowing you to increase your road safety when used on your car or the safety of your employees and bystanders during the darkest of nights when used at your home or business. This CREE LED comes with a 12 months warranty, brought to you by the leader in electronic devices as well as wholesale electronic gadgets..
Arabic: - أضواء LED - Chinese Simplified: - LED 聚光灯 - Czech: - Bodové osvětlení LED - Dutch: - LED-spot - French: - Projecteur à LED - German: - LED-Strahler - Hebrew: - נורית אור הזרקורים - Hindi: - एलईडी रोशनी - Hungarian: - LED reflektor - Italian: - Faretto a LED - Japanese: - LED スポット ライト - Korean: - LED 스포트 라이트 - Malay: - LED sinaran - Norwegian Bokmål: - LED Spotlight - Romanian: - LED-uri Spotlight - Russian: - Светодиодные прожекторы - Spanish: - Proyector del LED - Thai: - ไฟสปอตไลท์ LED - Turkish: - LED projektörler - Vietnamese: - Đèn LED Spotlight.